* This review contains spoilers for the previous books in the Parasol Protectorate series. To Sum It Up: Alexia can’t seem to just enjoy a normal, peaceful family life, not when she’s a soulless preternatural, her husband is a werewolf, and their daughter has unique, metanatural abilities of her own. The queen of the Alexandria Hive has taken an interest in Lady Maccon and her child and requests their presence in Egypt. Since one does not disregard such a call from Queen Matakara, the Maccon family is bound for Egypt, and, very likely, danger. Review: Binge reading the Parasol Protectorate series has been a most enjoyable experience, and I’m sad to now find myself at the conclusion of this reading journey. I’m not ready for the epic book hangover that’s about to commence. A bit of time has passed since the ending of Heartless, when Alexia and Conall welcomed their daughter, Prudence Alessandra Maccon Akeldama—she of the multiple appellations (and those don’t even include the additional endearments bestowed on her by her adoptive father, Lord Akeldama). Now a precocious toddler, she’s as sassy as her mother and as stubborn as both of her parents. Prudence is also adorable; she gets into a lot of hilarious mischief, again just like her mother. I’m thrilled that a grown-up Prudence is getting her own spin-off; if her early adventures are any indication, the new series is going to be fantastic! Young Biffy steps forward into the spotlight in Timeless, and as someone who’s loved the dandy since Soulless, I couldn’t have been happier. He’s had a difficult time adjusting to a different type of immortality than he originally aspired to, so it was nice to see him finally finding his place within the pack. I loved the direction Biffy’s story line took, as well as the significant role a certain other character (name omitted to avoid spoilers) played in it. 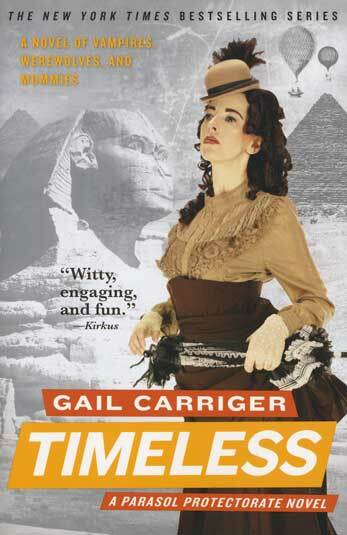 Alexia has experienced her fair share of travel across five books, and a good deal of Timeless takes place in Egypt. Of course, a bounty of humor is mined from the ordeal of simply reaching her destination. Not only is she accompanied by her husband and daughter, but she also counts the entire Tunstell family and an acting troupe among the party. The rather eclectic assembly may seem a little odd, but it makes perfect sense in Alexia’s world as well as makes for some hearty laughs. A number of the loose threads that were left floating around from the previous books are revisited in Timeless, and one in particular returns to sting Alexia sharply. While I was mostly satisfied with the resolution of the various plotlines, I couldn’t help wishing that a few things had been more thoroughly explained. I’m still not totally sure what the Order of the Brass Octopus is all about. All along, the series threw hints about the kind of man Alessandro Tarabotti, Alexia’s father, was, but even with what’s revealed about him in this book, he, too, remains rather a mystery to me. And I’m completely confused about Floote’s character now. What just happened?! Here’s the thing, though: I’ve had too much fun reading this series and loving these characters (Lord and Lady Maccon forever own a spot on my list of favorite fictional couples) to be too bothered by some unfinished plot business here and there. And maybe further answers await in Prudence’s series, which I am most desperate to read. 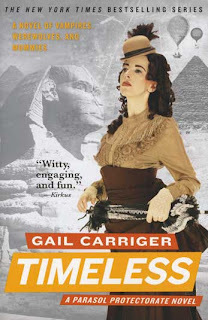 Thank you, Gail Carriger, for continuing to write about this world because I’m far from ready to leave it. All in All: Timeless is an excellent finish to a stellar series. Now, where is the move adaptation of the Parasol Protectorate? Because that would be awesome! i've heard great things about this historical series! *-* I want to read it! This series quickly became a favorite of mine; I highly, highly recommend it! Wow, sounds like a really solid series! I'll maybe get the series for my birthday. You should totally treat yourself! I'm still feeling the withdrawal of not having any more of these to read; Prudence can't get here fast enough!